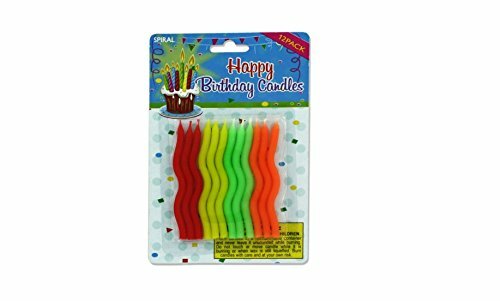 Perfect for birthdays, anniversaries or other special occasions, these Spiral Birthday Candles are a fun and stylish way to decorate a celebration cake. . Colors include red, yellow, green and orange. Each pack comes with 12 candles (3 of each color). Keep out of reach of children. Candles are approximately 3 1/2" tall. Comes packaged in a blister pack.